The question of dinosaurs is often posed by unbelievers to bring the Bible into question. For instance, evolutionists use dinosaurs to support their ancient-earth theory and to discredit the Bible’s teaching of a young earth. 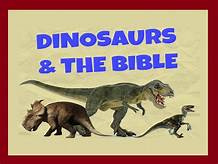 Are dinosaurs appropriately used as ammunition in attacks against the Scriptures; or are they just one more example of blank cartridges being fired at the Bible by unbelievers? Let’s begin with the evolutionist’s use of dinosaurs to support their ancient-earth theory. Many a modern-day children’s book begins with words like these: “Millions of years ago, long before man evolved, dinosaurs ruled the earth.” According to evolutionists, dinosaurs lived anywhere from 220 million years ago to 65 million years ago—the time when evolutionary science says dinosaurs went extinct. Yet, the evolutionist’s dating of dinosaurs is seriously flawed, as can be easily proven by a couple of things. First, in the last decade, scientists have discovered soft, unfossilized dinosaur tissue, which is an impossibility if dinosaurs went extinct 65 million years ago. Although the first discovery—unfossilized tissue at the center of a T. Rex bone—was dismissed by evolutionists as being erroneously identified as dinosaur tissue, the second discovery—proteins found in the soft tissue of a hadrosaur—has remained inexplicable to evolutionists. Unwilling to concede the crushing blow these two discoveries deliver to their cockamamie theory, evolutionists are busy trying to come up with an explanation of how moisture remains in a substance after 65 million years of dehydration. Good luck! Second, the carbon-14 dating method used by evolutionary scientists is based upon an erroneous assumption; namely, that the carbon-12/carbon-14 ratio has been the same for at least the last one hundred thousand years. Of course, such an assumption is refuted by the Bible, which teaches that the earth is only six thousand years old. Thus, the production of carbon-14 only began six thousand years ago, not to mention the fact that the entire carbon cycle was upset a mere fifteen hundred years later by a catastrophic flood. All we know about dinosaurs is gleaned from fragmented fossils. Relatively few complete or partially complete skeletons have ever been found. For the most part, all that has been uncovered is thousands of pieces of bone fragments. From these fragments scientists engage in scientific guesswork. The first guess scientists must make is whether or not the discovered bone fragments are from dinosaurs. Second, they must guess what piece of what bone from a dinosaur’s skeleton each fragment represents. Next, having assumed that a fragment is a piece of a particular bone from the dinosaur’s skeleton, scientists must then guess what the rest of the skeleton looked like. Finally, once the rest of the skeleton is envisioned by guessing scientists, the scientists then proceed to guess at whether the dinosaur had scales, hair or feathers. Obviously, much of what is publicized about dinosaurs today is based upon pure presumption. Apart from the fact that dinosaurs existed, there are very few conclusions that we can confidently arrive at from the fossil evidence. Among them are the following contentions: (1) the average dinosaur was a little larger than a hippopotamus (2) most dinosaurs had scales (3) most dinosaurs were plant eaters, and (4) some dinosaurs laid eggs. Along with the fossil record, other evidence of the existence of dinosaurs may be found in the historical record. Many an ancient myth and legend speaks of dragons—huge reptile like beasts similar to our modern-day understanding of dinosaurs. Ancient mariners, in particularly, told of dragons encountered on the seas. There is scarcely a culture to be found in the world today that does not have some legends about dragons, all of which are strikingly similar to each other. Alexander the Great claimed to have encountered dinosaur-like beasts, as did King Beowulf of the British Isles. The ancient historian Berosus wrote of such creatures. In the Middle Ages, scientists listed dragons among the animals of the day and many a brave knight reputedly set out to slay these fierce beasts. Unbeknownst to many today, the biblical record, like the fossil and historical record, attests to the existence of dinosaurs. While the word “dinosaur,” which was not coined until the 1850s, does not appear anywhere in the Bible, the Bible does speak of “dragons” (Psalm 74:13; 91:13; Isaiah 14:29; 30:6). In addition, the Bible refers to flying reptiles, such as “fiery flying serpents” (Isaiah 14:29; 30:6). The Book of Job, which is probably the oldest book in the Bible, describes a couple of dinosaur-like creatures in two startling passages. The first is called “behemoth” and may be read about in Job 40:15-24. The second is called “leviathan” and may be read about in Job 41:1-34. Leviathan is also portrayed in the Book of Psalms as playing in the sea (104:26) and referred to in the Book of Isaiah as “the dragon of the sea” (27:1 NIV). In Genesis 1:20-21, the Bible says, “And God said, Let the waters bring forth abundantly the moving creature that hath life, and fowl that may fly above the earth in the open firmament of heaven. And God created great whales, and every living creature that moveth, which the waters brought forth abundantly, after their kind, and every winged fowl after his kind: and God saw that it was good.” The Hebrew word in verse 21 that is translated “whales” in the King James Version and “sea monsters” in many modern-day translations is actually the Hebrew word for “dragons.” Thus, we may conclude from the Scriptures that “dragons”—dinosaurs—were created by God. If God created dinosaurs, and if the fossil, historical and biblical records all attests to their existence, then, the question becomes: What happened to the dinosaurs? In answering this question, we’ll see how true science always substantiates the truthfulness of Scripture. Far from disproving the Bible, as most people have been led to erroneously believe, true science always serves as proof of God’s infallible Word. The rocks in which dinosaur fossils are found indicate that they were deposited by a catastrophic flood of unprecedented proportions. Furthermore, it is believed by scientists that dinosaurs went extinct during a supposed Ice Age, since their fossilized remains have been found on every continent, including the polar regions. All of this squares perfectly with the biblical account of the flood. Not only was the flood catastrophic, but its aftermath would have resulted, thanks to the precipitation of the gaseous canopy of water vapor that previously enveloped the planet (see Genesis 1:6-8), in world-wide freezing temperatures in a post-diluvian world that had previously been like a giant greenhouse with a global tropical climate. Since some dinosaurs lived in the sea, some would have survived the flood (see Genesis 7:22-23). Most of those who did, however, would have died in the flood’s aftermath; that is, in the “Ice Age” that followed. If some younger, and therefore smaller dinosaurs were included on the ark, which was an enormous vessel, approximately 450 feet long, 75 feet wide and 45 feet tall, their lives would have also been greatly jeopardized by the freezing temperatures of a post-diluvian world. You have the author's permission to print and freely distribute to others this entire manuscript or any portion thereof. If you would like to help us continue to offer complimentary resources, like What the Bible Says About Dinosaurs, you can make a tax-deductible donation to "Time For Truth Ministries." All contributions should be mailed to: Time For Truth, P. O. Box 811, Townsend, TN 37882.